Sportsmen who enjoy pistol competitions will find themselves in a whole new league when they travel with the Universal Shooting Range 4 Pack Handgun Case. Rugged portability, theft-proof locks and a quick-draw design make this reusable CaseCruzer the right choice even if target practice is the only ambition. Pistol range competitors will appreciate the innovative quick-draw position of the four handguns. And when traveling to clay target events and trade shows, they will benefit from the singular slot interior design that guarantees equipment will not dislodge or collide while in transit. The handgun carrying case is also fitted with double-throw latches for ultimate safety. The Universal Shooting Range 4 Pack Handgun Case can house most semi-automatic handguns that are 7" to 9.25" in overall length, with barrels up to 4". Many international brands are a good fit, including FNH, Auto-Ordnance, Sig Sauer, Colt, FNS, H&K, Glock, Remington, Springfield, Beretta, Ruger, Walther, and Smith & Wesson Steyr. "The real concern for sportsmen and pistol competitors is safety and reliability, not trophies and blue ribbons. We're proud to manufacture some of the safest, most durable carrying cases available. And we enjoy supporting the many responsible citizens who own firearms for protection or shooting range competitions," says Tatiana Briceno, CaseCruzer marketing director. 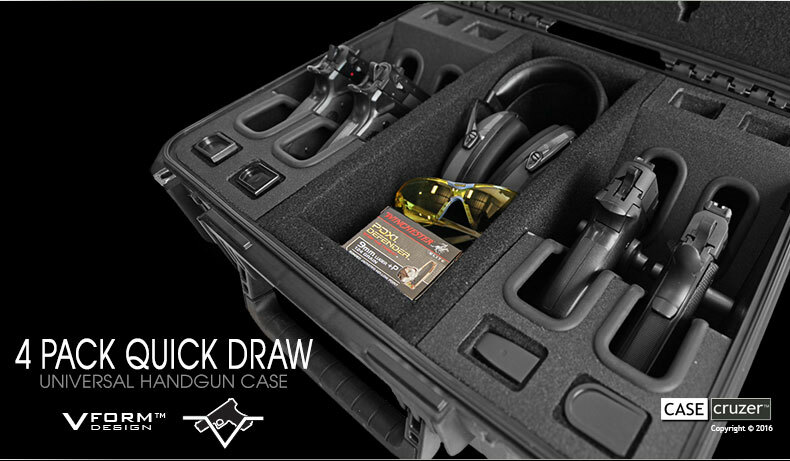 Another advantage of the quick-draw case is easy access to eight magazines and other accessories (ear muffs or protective glasses, for example) when participating in pistol range events or merely practicing. The National Shooting Sports Foundation (NSSF) reminds pistol enthusiasts to always wear ear and eye protection. Sport shooting experts also agree that security and proper storage of handguns is essential. For that reason the carrying case is designed with stainless steel flanges. This feature allows sportsmen, competitors and collectors to padlock the trigger latches so that the case cannot be tampered with or invaded by thieves. The CaseCruzer quick draw case also blocks out water, air and dust thanks to the ambient pressure equalization valve, high-quality latches, and o-ring seal. The shockproof hard-shell exterior will easily stand up to forcible impact or vibration And a lifetime warrantee means the reusable transport solution will outlast freezing rain, tough love, and even a very bad day of target practice. Should evacuation be necessary, grab and go with one rubber over-molded fold-down handle. Exterior dimensions of the gun case are a trim 20.25"L x 16.93"W x 8.78"H. When empty, the case is 11.20 lbs. When fully packed the case must be checked-in with other luggage at airports. It is airline safe ATA 300 rated. Black only. Sometimes even the best sportsmen miss the target. But not CaseCruzer. In the big league of quality and reliability, we aim to please.